Divorce is hell. 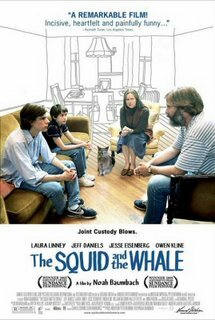 In the case of Frank and Walt Berkman, adolescent sons to Joan and Bernard in Noah Baumbach's "The Squid and the Whale," the tailspin following their parents' rancorous separation produces far more troubling consequences than two homes and frequent commutes between them. Set in sunny 1980’s Brooklyn, Frank (Owen Kline) and younger brother Walt (Jesse Eisenberg) enjoy a financially modest but leisurely life as sons to two writers. As mother Joan’s (Laura Linney) literary success balloons and father Bernard’s (Jeff Daniels) prospective book deal falls through, so too does their marriage destabilize and dissolve. Piled onto their problems is Joan’s extramarital affairs and Bernard’s unrelenting intellectual pig-headedness. His ultra-competitive approach to the film’s opening familial tennis match - though initially in the vein of co-producer Wes Anderson’s brand of dry humor - ultimately adopts a dark and distressing significance when the plights of his children take hold and his corrosive influence upon them is revealed. Walt represents the loyalist child archetype in divorce cases by unflinchingly siding with his father (Jeff Daniels) and embarrassingly recycling his every spouted bit of literary wisdom about Kafka or Fitzgerald. His doomed march down his jerk of a father’s path is sorrowful to behold. The divorce has even darker and immediate effects on Frank, whose stated dream to become a tennis star are repeatedly shot down by the overly pragmatic Bernard. Rendered emotionally crippled and aimless by his parents’ split, Frank plunges into binge drinking, endless profanity, and public masturbation. “The Squid and the Whale” is acted with self-possession and restraint, especially by the prickly Daniels and the irrepressible Linney. It ably balances the humorous idiosyncrasies of the Berkman family members with the psychological lacerations inflicted upon them by the divorce. Baumbach’s film will especially resonate with children of divorce, who are befittingly portrayed in a manner akin to victims of an emotional car crash learning how to walk again.